To combat this, we have developed a range of hoof supplements. 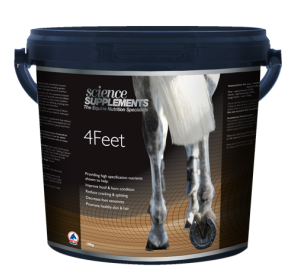 4Feet hoof supplement is specially formulated with an essential mix of nutrients which improve the condition of the hoof and horn, reduce cracking and splitting, decrease foot sensitivity and promote healthy skin and hair. The nutrients can be added straight to the feed, providing an essential mix of micronutrients which include Biotin and Calcium. However, due to the slow growth of the hoof, the effects of these nutrients won’t be noticeable until after a few months, which is why our 2kg tub gives a 6 months’ supply. 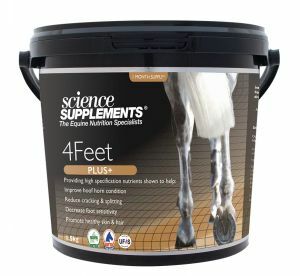 4Feet PLUS is a super strength formulation for the most challenged feet. With a combination of SEVEN active ingredients, it is designed to be fed to overcome the most challenging of conditions. Once improvements can be seen, then we recommend feeding the standard 4Feet to maintain healthy feet.